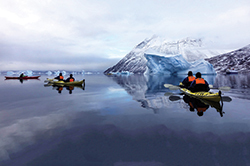 Quark's 2018 and 2019 Arctic adventures feature trail-blazing new expeditions and an exciting set of perennial favorites which offer the avid adventurer even more ways to explore the most unique and enriching regions in the world. *See landing pages below or call us today for applicable amenities on each sailing date. Restrictions apply.